Angry Asian Buddhist: Where is the first Khmer American temple? 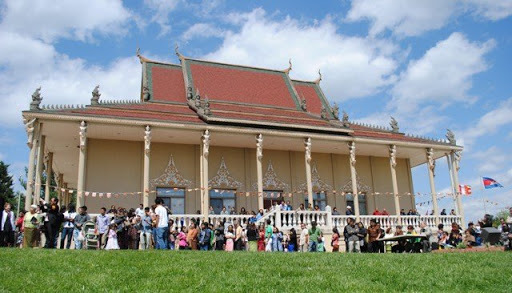 Where is the first Khmer American temple? A good chunk of my questions this month ask to identify the first, the largest, the most whateverest. In the past, I’ve pointed to these superlatives to highlight Asian Americans’ significant role in the development of Buddhism in the United States. But there is a more important reason for asking these questions. I want my readers to consider the different dimensions of Buddhist America. It’s not just about breaking down ethno-nationalist assumptions and showing that many Khmer Buddhists are not from Cambodia, or that many Cambodian Buddhists are not Theravada. I also want us to think more about where Asian American Buddhists are and how long we’ve been here. That brings me to the question of today’s post, which was answered by @StarPhalla. The answer is Silver Spring, Maryland, home to Wat Buddhikarama, founded in 1978. I’m open to the notion that I have the wrong answer to this question, so I’d genuinely appreciate input from the many who know more about Buddhist America than I do. When I first posted this question, I assumed the answer was Providence, Rhode Island. This past November, I visited Wat Thormikaram for Kathina, where I was told that the temple was the oldest in the United States. Wat Thormikaram was founded in 1981. But @StarPhalla pointed out that the Cambodian Buddhist Society was a bit older. CBS was organized in 1976 and incorporated in 1978. The temple has moved a few times since then, but can now be found in Silver Spring. In contrast, the cities with the most Khmer Americans are Long Beach, California and Lowell, Massachusetts. As I mentioned before, I’m happy to send a custom-designed postcard to anyone who correctly answers my #AAPI questions on Twitter, and @StarPhalla is the first postcard winner! This is good stuff. I for one know very little about Khmer Buddhism and communities in general. I'm intrigued by the statement that not all are Theravadin Buddhists. Given its proximity to Vietnam, are you implying that there are Mahayana communities as well? The majority of Khmer Buddhists are Theravadan. But there are some that practice certain traditions which Mahayana Buddhist are known for, like honoring Quan Yin. Same is true for the rest of SEA.